It was nearly 90 years ago when the first 'Ghan' railway service set out from Adelaide bound for Alice Springs. The construction of a complete line all the way to Darwin was one of the earliest dreams of the fledgling colony of South Australia soon after its establishment by free settlers in 1836. 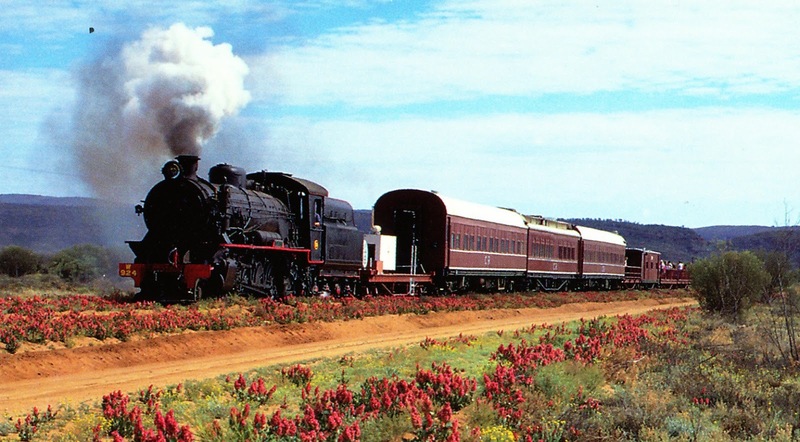 Apart from the massive cost, the harsh climate and rugged landscape were always going to make the project a challenge and after the first sections were begun in 1878, it was nearly fifty years before a train could make an uninterrupted journey to the tiny outpost Alice Springs, right in the centre of Australia. 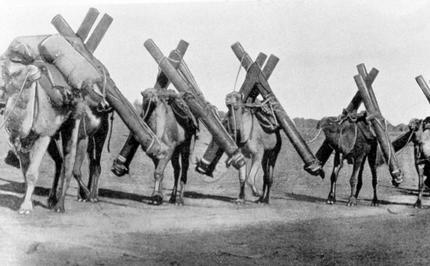 Until that time, camels had to be used to transport goods and the few intrepid passengers along the route where tracks were still being laid. Camels were first brought to Australia for the ill-fated Burke and Wills expedition in 1860 when 26 of the beasts and their Afghani handlers were brought from India in the belief they would be invaluable for work in the harsh desert climate. That decision was one of the few successes of the expedition that ended with the deaths of nine men, including both Robert Burke and William Wills. Thanks to the nickname, The Afghan Express, bestowed on the service in the early days, it is now just 'The Ghan', and reflects with great respect the invaluable service provided by the expert Asian cameleers in opening up the country for agriculture and other primary industries like sheep and cattle farming. During WWII the route was crucial for the supply of Darwin, with trucks replacing the hardy camels between Alice Springs and the beginning of the short line south of Darwin. Even with modern diesel locomotives, the old original route remained problematic with floods and sandy soil causing many delays and it was decided to build a completely new line to the west. The last train ran on the old service in 1980, bypassing the remote towns of Maree and Oodnadatta. Today visitors arriving by 4WD can still see rolling stock and a locomotive abandoned in Maree and even though the track and sleepers are long gone, old stations and water towers are preserved in memory of the early days. It was with great excitement and fanfare that the 126-year dream of the first settlers was finally realised in 2004 when the first train from Adelaide rolled into Darwin after travelling nearly 3000kms in 54 hours. The completion of the railway line to Darwin was the largest and most expensive civil engineering project since the Snowy Mountain Scheme of the 1950s and '60s. Australia's government railways moved to private operators in the 1990s and now the company, Great Southern Rail (GSR), owns the route and has significantly enhanced the service to incorporate longer stops at both Alice Springs and Katherine so that passengers can enjoy day tours to the wonderful sights at both locations such as the four-day Ghan Expedition journey which takes travellers on an epic outback adventure with excursions in Katherine, Alice Springs and Coober Pedy across four days and three nights. The modern train runs weekly and provides passengers the choice between all-inclusive Gold and Platinum classes, both in comfortable sleeper berths with gourmet dining facilities in the sumptuous Queen Adelaide Car or the exclusive Platinum Club. 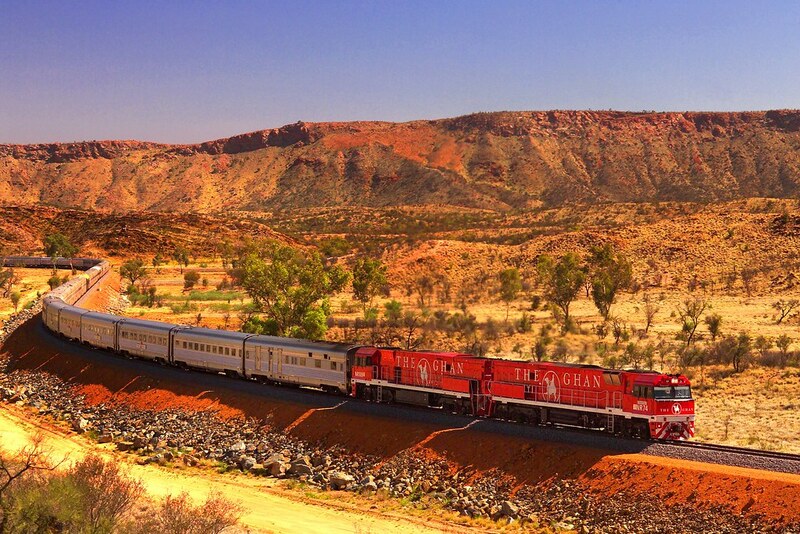 The Ghan is without doubt one of the most significant railway journeys in the world alongside our own Indian-Pacific and even the mammoth trans-Asian odyssey, The Trans Siberian Express. Apart from the valuable freight link to the south, saving many days of sailing for ships from Asia, railway enthusiasts from all over the world regularly travel to Australia for this remarkable experience across a landscape full of history and unlike anywhere else on the planet.